The Unitech AS10 barcode scanner gives your business affordable contact scanning, ideal for office asset management, libraries, or small to medium volume retailers. Lightweight and easy to use, the AS10 promotes quick, headache free barcode scanning. At 4.23 oz, the AS10 is light in hand, and the ergonomic design allows you a full work-shift of use with minimal strain. The lightweight design and lack of moving parts increase the durability of the scanner, protecting it from the accidental drop from a counter. The AS10´s 1D imager provides accurate reads from contact to up to 2 inches away. A maximum scan rate of 100 scans/second gives you the right data you need in even high-speed scanning environments. The scanner can be configured to edit or modify scanned data, excellent if your software requires any changes to barcode data before processing. 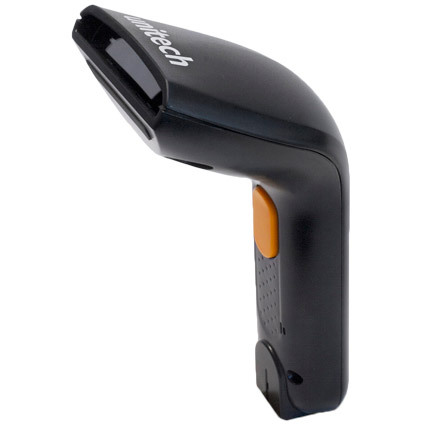 A 1-year warranty comes standard, making the Unitech AS10 barcode scanner a smart and economical solution. Dimensions (W x D x H): 3.19" x 7.07" x 2.54"
Decode Range: Contact to 2"